Creating a multi-functional kitchen space is essential to a large household. 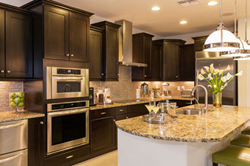 CabinetDIY utilizes their expertise by sharing some tips in remodeling and designing a kitchen using appliances and accessories that tailor to specific households. A great kitchen cabinet design results from a creative vision and attention to detail. The kitchen is one of the most essential activity areas in the home. The type of cabinets used in the kitchen, as well as its design, reflects on the style of the user of the space. The design of the kitchen should not only look fabulous but at the same time serve as a room with great functionality for the family who will be using it. Before starting a kitchen design project for a household, it is important to think about the family's living habits. One might think that the kitchen is only designed for those who have a passion for cooking. However, this usually does not apply to all households. For example, a working household hardly has the time to prepare home cooked meals. They either order take out or warm up pre-packaged meals. What type of expectations could this family have for their kitchen? An extra-large pantry space for dry food and snack storage may be useful to them. They may also like an individual full-sized freezer to store some extra frozen entrees. Although this household might hardly ever cook, it doesn't necessarily mean they prefer to eat their food from take-out containers. Therefore, having a double dishwasher is another kitchen essential to keep in mind. It has recently become an increasingly popular kitchen design trend and serves the needs of a busy household who do not have time to clean plenty of dishes every day. The dishwasher can also cater to those who love to host large parties. A multi-functional island that serves as a casual breakfast and a homework station for the kids is a viable option for a busy household. Large islands can be used for multiple purposes and should always include an electric outlet that supports any media plugin as well as plumbing for an additional hand sink or beverage sink. Make sure to have these options in mind during the planning stage of a kitchen. What about the dad or mom who loves to cook meals for their family and friends? What can a designer do to make the kitchen space more gourmet friendly to the family chef? A double spice rack on each side of the stove will come in handy for the chef who wants to organize his or her collection of various exotic spices. A pull out tray throughout the base cabinets will allow easy access to the hard-to-reach items inside the storage. For the family baker, a kitchen mixer lift with soft release drop is a perfect add-on accessory. A cabinet electric plug for the built-in mixer lift will be needed, as well as a cookie sheet divider, which can be useful for those in the household who love to organize. The best place to install these dividers is on the top of the 24-inch deep refrigerator wall cabinet. The cookie sheets are large, and they will be easy to slide in and out of the cabinet, which was not originally easy to access. Most importantly, make sure to communicate with the electrician and plumber during the design stages as this can be crucial to the design and functionality of the space. Built-in appliances are becoming more and more popular these days. They keep the counter more functional and more spacious as possible. A few examples of built-in appliances include microwave built inside the base cabinet, counter flush electric cook top and built-in wall oven with a warming tray. Regardless of one’s preference and style, these options are essential to everyone’s needs. Keeping these options in mind can help create a functional and useful kitchen space for anyone in the household. CabinetDIY is founded by a group of passionate interior designers and professional cabinet makers. All members of our design team have professional interior design background and at least 5 years or more actual construction field experience. It is our passion to assist our customers in designing and building their dream interior projects. As a leading RTA cabinets supplier, CabinetDIY is proud to provide their customers a thoughtful design consulting service with a professional 3D kitchen layout. To request a free Kitchen Cabinets design service, please visit : http://www.cabinetdiy.com/style123/measureit.